Accepted Scientific Name: Blossfeldia liliputana Werderm. 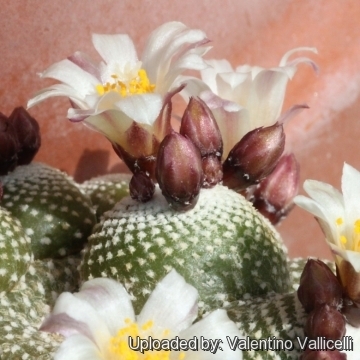 Origin and Habitat: Blossfeldia liliputiana is established over a wide geographical area ranging from Southern Bolivia (Potosí Department) to north-western Argentina (Jujuy, Salta, and Catamarca Provinces), at elevations of 1200 to 3600 m.
Habitat: Plants are found growing on rocky slopes and often between cracks in the sides of vertical stone cliffs mainly on shale like rock formations often close to waterfalls where they have a almost continous water flow running over them, but can withstand severe drying out and (in habitat) they can to survive nearly complete desiccation, recovering when fog, mist or rain returns to their natural environment. 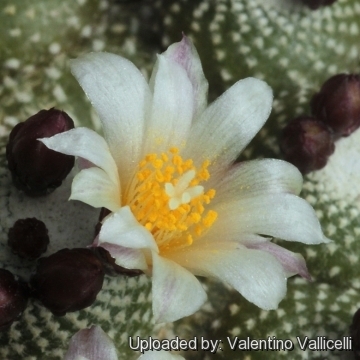 Description: Blossfeldia cyathiformis nom. nud. 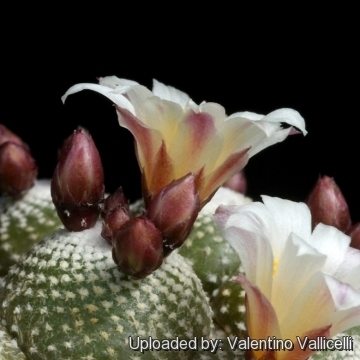 is one of several unpublished names of Ritter that still occur in commercial lists and now included in Blossfeldia liliputana. 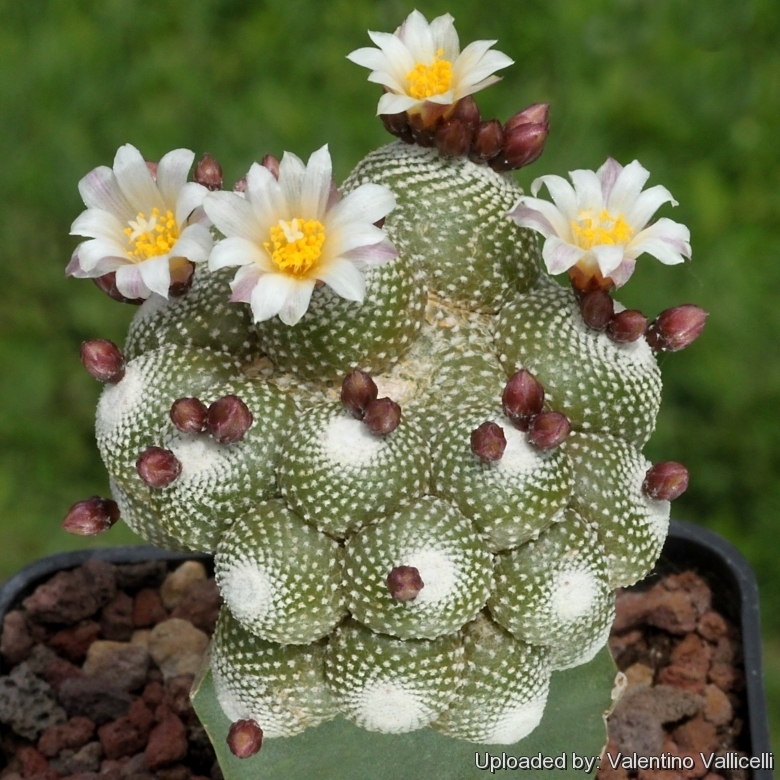 It is a solitary or clumping miniature cactus, with no rib and no spines. 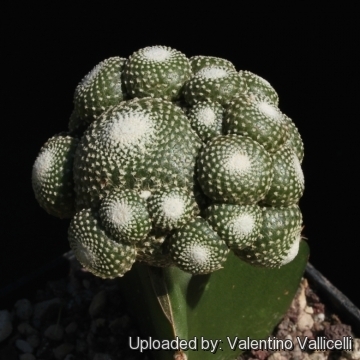 Stem: Flattened disc-shaped, gray-green, usually up to 1,2 cm in diameter (rarely exceed the 2, but in cultivation grafted plants may attain a bigger size. Flower: Diurnal, cream-coloured diurnal, 6-15 mm long and 5-7 mm diameter and self fertile. 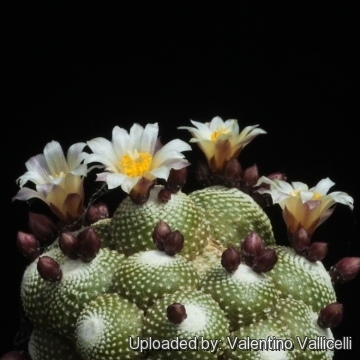 This remarkable miniature is the most enigmatic of all cacti, confounding us with its physiological, anatomical, morphological, ecological and evolutionary peculiarities. 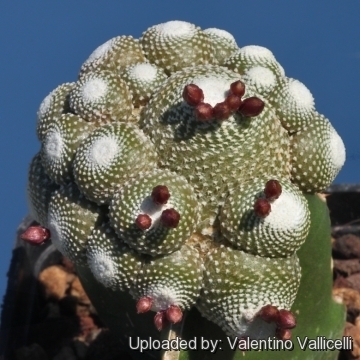 They are apparently the only cacti that are capable of completely drying out and then rehydrating their cells when watered (called "poikilohydric"). It has been found to lose up to 80% of its moisture in one year and then survive drought for an additional year, making it very similar to mosses and lichens in being adapted to withstand near complete loss of moisture! It could be that what looks like a few dried out and dead seedlings could be revived by a thorough soak. Except for certain parasites and aquatics, this species possesses the lowest density of stomata of any terrestrial flowering plant. Cultivation and Propagation: Some shade is preferred and a very well draining potting mix. Frost Tolerance: At least -10°C. Their specialized environment (mountain rock cracks), and the extremely dry environment makes them very sensitive to root loss. 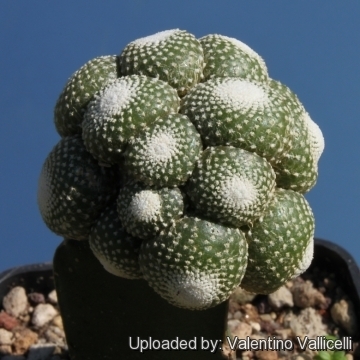 Because of their slow growth rate, Blossfeldias are often grafted, which causes them to grow very fast and offset heavily but lose their characteristic disc-like shape, becoming quite globular and bloated. In this case the minimum temperatures acceptable should take in account the requirements for the rootstock. Any way this miniature is grown, it is a true wonder of the vegetal kingdom. Many growers graft tiny 2-3 month seedlings and they grow on very successfully that way.